July 6, 2012. A sad day for us. Our 12 year old bearded dragon went Home. She was older than most beardies as their average life span is 8 years. She was healthy and active right up to the end which is unusual as they usually stop eating and drinking before they die. Not Penelope. Instead she ate then curled up in her water and Chip found her this morning. No, she didn’t drown. Her head was above the water. She just must have thought being in the water was the perfect place to wait to go Home. I’m half laughing half crying as I try to type this. 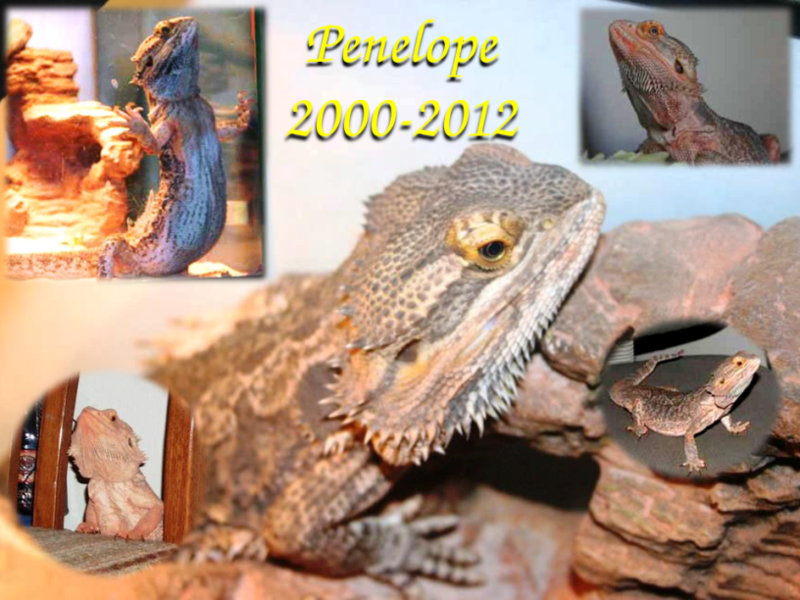 Penelope was not your average beardy! She loved snuggling and kitties. She grew bigger than most. And even with a huge cyst on her back, she kept going. We knew this day was coming and expected it years ago. But no, she loved life and wanted to break all the lizard rules! LOL! We are having a hard time as are the kitties. We’ll be burying her next week, but the kitties keep looking for her and are depressed. We cry a lot. You wouldn’t think a lizard would make the house complete but we’re definitely finding that there’s a certain quietness in the house and the place where her cage was is dark without her lights going. Sweet Penelope, we love and miss you to the end. Click on memorial photo to view FULL size.